My sister insisted Valentine’s Day balloons were needed to complete her decorations, so my husband, sister and I made a stop before our trip to the cemetery. While we were carefully, rather obsessively, selecting the balloons, because after all the purpose of these balloons were not for the average happy occasion, it occurred to me that I wanted to do a balloon release. Why do we have to wait for another dreaded Devastation Day or Amy’s birthday to experience the unexplainable peace I feel after I write my message and send it on up with love. Everyone eagerly agreed so we released our balloons about a half hour before sunset. From the minute we let go of our balloon messengers, it seemed as if we were the only three people standing in that big cemetery … once again mesmerized while watching our balloons soar, dance and twirl their way towards the heavens. It seems that each time we do this, my balloon lags behind but eventually races to the top, as if anxiously wanting to be the first to have my message read. Just as we were about to leave, my husband happened to look up and noticed a perfect cross drawn in the sky where the balloons had traveled. I could have sworn I captured that cross in the sky on my iPhone but when I got home, the photo was gone. Maybe it was only meant for the three of us. My life without Amy is taking a different turn. For the past few weeks, I keep having visions of Amy flash in my head, followed by the deepest sadness. Life is whirling around me like a storm where you know you should seek cover, but I robotically keep walking. Not so much pushing with the strength the adrenaline provided in the first year, but more like I am captured on a pirate ship and willingly walking the plank because I cannot put my daughter’s life on a shelf in a way which would allow me to resume business as usual. Amy was here and I cannot pretend for anyone that losing her has not destroyed my identity. 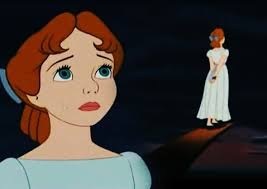 Just like Wendy Darling in Peter Pan, I will walk the plank if I am forced to make a choice which goes against who I am and what a life meant to me. I will not surrender to a world who only honors people who live in their happy place and has no tolerance for those who do not. Gone is the fight — gone are the hopes that those who have hurt us will ever realize what their actions have done to our life on the other side of Devastation Day. Their nonchalant attitude is numbing me now. I hope that is a sign that on the other side of this numbness is my nonchalant attitude towards them. I say that without malice and the utmost sincerity. It’s a sort of defeated acceptance. Not so much an acceptance of Amy’s death, but more of an acceptance that life and people are disappointing. Today, I don’t want to curse about the ones who have hurt me. Now I can almost imagine myself silently walking right by them resigning with my white flag … The holdout is over. You win, I lose. All expectations are off the table. And the love comes trickling down. Or something like that. No idea why this song started playing in my head. So far, not true. I am so sorry for your loss.. The daily struggles are something no mom should ever have to go through.. I am sorry for your loss as well. After reading a little of your blog, I know you know. My deepest sympathy to you. Annika, thank you for taking the time to read my post. I remain sorry you can relate. Tersia, it is a lonely journey. Warmest regards to you.